Get real-time data directly into your DNN portal! Visual Data's JumpStart has developed an easy way to get sensor readings directly into your DNN database. I have a sensoring system that measures light intensity and temperature in real time. I need these data into my database in my DNN portal to enable me to investigate on how the daylight and temperature interact with each other. So I need two tables in my database: one DayLight table and one Temperature table. And I need a way to get the data from the sensors directly into the database. The sensor readings will be stored in a textfile, and this textfile will be closed after a predefind number of readings is reached. Then the file will be send to my DNN portal where the sensor reading module will automatically read the textfile and write the data into the database at the moment I open the page where this module resides. 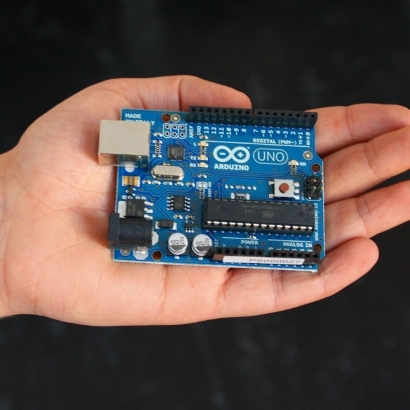 An "Arduino" microcomputer that makes up the sensoring system. The "GoBetwino" interface that takes care of the filetransport between the Arduino and my DNN portal. The "WINSCP" open source FTP application to send the files to the server on wich my DNN portal resides. and a couple of BAT and TXT files that are used as commandlines to get the WINSCP send the files and do some other housekeeping stuff. See the help pages that I created to show you how this is done! 6-4-2012 12:19:20 The log file: C:\arduino-0023\VDW_SensorTechniek\gobetwino.log does not exist, can not log data. The ARDUINO project is an open source hardware system that alows you to build your own sensoring equipment. It is an electronics prototyping platform based on flexible, easy-to-use hardware and software. It's intended for artists, designers, hobbyists, and anyone interested in creating interactive objects or environments. The GOBETWINO application enables an ARDUINO to communicate with other Microsoft applications. Gobetwino is kind of a "genreric proxy" for Arduino. It's a program running on a PC (Windows only - sorry), that will act on behalf of Arduino and do some of the things that Arduino can't do on its own. So it works like a go between, hence the name.